Kids just can’t get enough of the fun and yummy Organic DelishFish. 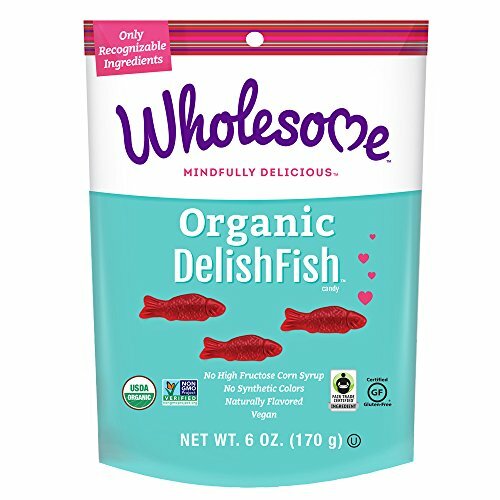 With the fun shapes and sweet flavor, DelishFish make a great snack for road trips, movie nights, and school lunches! DelishFish are made with organic, clean ingredients. They are also sweetened with Organic Cane Sugar. They are free of high fructose corn syrup and synthetic colors and flavors. Giving your kids a sweet treat has never been so worry free! Wholesome! Organic DelishFish are USDA Organic, Non-GMO Project verified, gluten free, vegan, and Kosher. Wholesome! adheres to strict standards and is committed to better environmental choices, so products are safe for the whole family. Sweet is always better when it’s wholesome. That’s why we only use real and recognizable ingredients in our organic, better-for-you products. Every drop, spoonful and snack from Wholesome is always delicious. And by choosing Wholesome, you are helping to make life sweeter for all.